If you read other blogs about simple living and minimalism, you may be noticing a trend: They’re going away. A few weeks ago I wrote a post called The Most Important Advice in the Universe. The general idea is that everything has its moment, then it’s best to let it fade away. Anger, fear, rejection and pain need to fade away. But some of my favorite bloggers seem to be fading away. Are yours? And what about me and this blog? As I’ve said before, writing about minimalism and simplicity is a strange thing. It would be even simpler and even more minimalist to not do anything at all. So why would people bother to devote hours of their life to writing about how they don’t waste their time and have sculpted their life into a masterpiece of efficiency, thrift and laziness? But we do. We write about simplicity and minimalism to help focus our own ideas, to share what we’re learning with others and because we enjoy bouncing our ideas among our readers to see how the community helps shape them. So why are some blogs that have been gaining in popularity going away — or looking like they might? Blogger Chris Baskind (whose blog More Minimal I had never visited until I saw a mention of its demise on Brett Oblack’s Twitter feed) wrote a post about the end of his blog on August 18. Short, sweet and final, I suppose — although he had the time to throw in an unneeded comma. Chris was gone before I knew he was here. And Brett Oblack’s Step 1 Minimalist site hasn’t been updated in six weeks or so, and even then it was a guest post from Lynn Fang, a good writer who has stopped by So Much More Life a few times. What are Brett’s reasons for stopping when he was just getting a good thing going? I’ve had a private email conversation with him and didn’t get permission to share it, but it doesn’t sound like his site will be continuing. A more established blogger, David Damron, seems to have lost interest in The Minimalist Path these days. He’s posted that his life is changing — and it sounds like there may not be much room for his blog in it. When I checked his site on September 26, the domain registration company had replaced it with a notice that the domain had expired two days before. The site was back up yesterday, but there are no new posts. Add to this the recent decision by Everett Bogue to no longer accept comments on his site — effectively making the blog irrelevant and leaving him talking to himself — and things could seem fairly bleak for minimalist bloggers. Who else has gone or is going away? Is there someone who used to be on your RSS feed or in your mailbox who isn’t there now? Go check their site, ask them what’s happened to them and let them know you care. You may be the only one who does. Things change, however, and for every blogger who leaves the scene, dozens more press Publish for the first time. Blogs are fluid, changing, nebulous and subject to the whims of frustrated writers and fickle readers. They rise, fall, flame, resurrect, fade, fizzle and flop. And what about me? I’m still here. I’m still writing — still striving for relevance in a crowded field and with fewer readers than I’d like. As long as you’re reading, I have a reason to continue. As long as I have something I want to say, I know I can say it here when no other forum will allow me to sound off. Things don’t look bleak to me. In fact, I suppose my voice is more important than ever. Maybe I’m moving up in the queue. I can’t promise I’ll always be here, but I’m here now and plan to stay for a while. I hope you will, too. I’m still here too, Gip! I’ve got no plans of going away any time soon and actually have another, ancillary, project in the works. I always appreciate the comments you leave at The Simpler Life and I’m glad you’re still here too! Hi, Sam. I’ve noticed that you’re still here. It’s almost to the point that a list of those who are still around might be shorter than a list of those departing. You write good stuff and interact well with your readers. That’s why you’re still here. I’m glad you’re planning to stay awhile too, Gip! But you’re right about several on the RSS feed who haven’t posted in a long time. Chris Baskind has a new blog at ecominima.com, which has been up for about a month now. I’m going to update the old blogroll this weekend to cull the old and add the new. I hope So Much More Life makes the new blogroll, Meg. It will be hard to decide if some of the current ones are completely gone or not. I’m sure there are others fading away that I didn’t mention, but I hope someone else will point them out to me. I think you are right about things being fluid – many blogs will come and go, there will only be a small minority that really make a lasting impression and stay the distance. Hopefully that will include both of us! I understand your frustration. I love to read the updates and learn all I can about this subject. I have noticed many of the blogs are fading away. A good blog is a hard thing to find and I hope you’ll be around for a long time. Your post always get my attention and I thank you for that. Keep on keeping on! I’ll be here waiting on your next great post. Kate — Yes, I’m well. We’re both doing a good job, so I think we’ll be around a while. Beverly — Thanks for joining the conversation. I’m glad you’re here and that your joining the minimalist blogging revolution… or whatever we want to call it. Hey Gip – a pretty timely post for me. I’ve been struggling with a lot of what I mentioned in our conversation (feel free to share any or all of it). I do want to keep Step 1 Minimalist going and will update it again tomorrow actually. I was proof-reading my article when I happened to see this post ironically. Thanks for taking the time to speak with me (and about me) on this issue. I was hoping to hear from you, and that’s what I was hoping to hear. I’d like to see you talk about the reasons for your absence on your blog — along with the reasons for your return. I think your readers will be interested in that. When you have your new post up, please come back and link to it. I’ll be waiting for it, and you may be surprised how many others are, too. Just wanted to let you know that I’m still here reading your blog regularly. I don’t comment much, but I do enjoy it, so I’m glad you’re planning to stay around for a while. I’m even in the planning stages of starting a blog myself. So, as you said, the blog world is fluid that’s one of the beauties of it. I have been on vacation for a month so I haven’t been reading other blogs because I was tending to my own in the limited time I had access to the net. Also I have only been home for less than a week and have been busy settling back in so I hadn’t noticed others disappearing. I do have an opinion though and it is something that had struck me a while back. There is the element as you suggested of minimalism just being an excuse for laziness for some people and was just one step short of actually living on the street. While others I think may well have had the minimalist lifestyle at heart but were relying it to make a living and when that didn’t really eventuate they abandon blogging about it altogether. For me minimalism isn’t just a passing fad it is about not being a glutton for commercialism and reducing what I own because it’s just weighing me down and recycling it to others in order to minimize my impact on the environment. I have never considered it a likely source of income and don’t even allow ads on my blog because that would be hypocritical in my opinion. That is not to say these are the reasons why some of these good bloggers have left the scene but you can be sure it is why some of them have. Some my just be busy doing other worthwhile things off line. There may come a day when I no longer wish to maintain my blog but that won’t be because it’s not making me a buck or I am over the whole thing or I am just too lazy. Hopefully it will be because I have found other satisfying pursuits that take up too much of my time while I continue to live up to all that I have written about in the past. Not that I have ever claimed to be a minimalist in the first place. My goal was only ever to reduce my belongings to a sensible level that suited me but in doing that I have learned to be a lot more minimalist in my idea of what is necessary to my comfort and vanity and far more environmentally concious. Thanks for staying around, Amy. And Fatima, welcome. I’m looking forward to following your blogging experience. Colleen — You make some very good points. 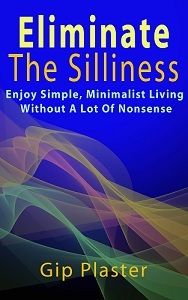 At first, I hesitated to use the term minimalist because of the baggage that comes with it. I’m just trying to have a simple, more considered, more interesting life. By the way, Brett is back, and I’ve edited the post with a mention of that. It is easy to be enthusiastic in the honeymoon phase of a blog, especially if you believe it will change your life. But since everyone is different, one person’s lifechanging experience might not be repeatable. The disappointment could be too much to endure. I think bloggers get disappointed when they find people aren’t as enthusiastic about them as they expect them to be. But there are always more people reading than you think there are! Good to have to here, Jess. You always offer good comments. I know I’ve been sporadic posting for the past couple months myself, but it’s not because I’m leaving (I’m actually just starting! ), it’s because I’ve been hammering out all the strange nuances of getting married. Food, photos, reception hall, decorations, etc. Even that, though, is teaching me some interesting lessons I hope to be sharing with readers in the near future. Taking a week off after the wedding has really helped to clear my head! Thanks for the compliment, Robert. Blogs are about interaction, and bloggers who forget that are also on their way out. You have a good start on a blog and I look forward to following its progress. When you’re ready, we’ll talk about a guest post here to better introduce you to my readers. Looks like Less Is Fabulous hasn’t been updated since this past July, with no expression of intended slowdown or quitting. We’ll add Less is Fabulous to the “fading away” list. After that long, I’d say it’s gone. I just discovered your site so PLEASE DON’T GO!!!! I just discovered minimalism and it’s sad to see them slowly transition off. I will still follow them nonetheless. Jenny, I don’t plan to go anyway. Thanks for visiting. I just checked your blog, and I encourage my readers to check it out, too. Nice job.